The Baruch GIS lab crew just published a paper: New Yorkers on the Move: Recent Migration Trends for the City and Metro Area. The paper (no. 15 Feb 2018) is part of the Weissman Center for International Business Occasional Paper Series, which focuses on New York City’s role in the international and domestic economy. We analyzed recent population trends (2010 to 2016) in New York City and the greater metropolitan area using the US Census Bureau’s Population Estimates to study components of population change (births, deaths, domestic and international migration) and the IRS Statistics of Income division’s county to county migration data to study domestic migration flows. The population of New York City and the New York Metropolitan Area increased significantly between 2010 and 2016, but annually growth has slowed due to greater domestic out-migration. Compared to other large US cities and metro areas, New York’s population growth depends heavily on foreign immigration and natural increase (the difference between births and deaths) to offset losses from domestic out-migration. Between 2011 and 2015 the city had few relationships where it was a net receiver of migrants (receiving more migrants than it sends) from other large counties. The New York metro area had no net-receiver relationships with any major metropolitan area. The city was a net sender (sending more migrants than it received) to all of its surrounding suburban counties and to a number of large urban counties across the US. The metro area was a net sender to metropolitan areas throughout the country. For the domestic migration portion of the analysis we were interested in seeing the net flows between places. For example, the NYC metro area sends migrants to and receives migrants from the Miami metro. What is the net balance between the two – who receives more versus who sends more? The answer is: the NYC metro is a net sender to most of the major metropolitan areas in the country, and has no significant net receiver relationships with any other major metropolitan area. For example, for the period from 2011 to 2015 the NYC metro’s largest net sender relationship was with the Miami metro. About 88,000 people left the NYC metro for metro Miami while 58,000 people moved in the opposite direction, resulting in a net gain of 30,000 people for Miami (or in other words, a net loss of 30k people for NYC). The chart below shows the top twenty metros where the NYC metro had a deficit in migration (sending more migrants to these areas than it received). A map of net out-migration from the NYC metro to other metros appears at the top of this post. In contrast, NYC’s largest net receiver relationship (where the NYC metro received more migrants than it sent) was with Ithaca, New York, which lost a mere 300 people to the NYC metro. All of our summary data is available here. For the IRS data we used the county to county migration SQLite database that Janine meticulously constructed over the course of the last year, which is freely available on the Baruch Geoportal. Anastasia employed her Python and Pandas wizardry to create Jupyter notebooks that we used for doing our analysis and generating our charts, all of which are available on github. I used an alternate approach with Python and the SQLite and prettytable modules to generate estimates independently of Anastasia, so we could compare the two and verify our numbers (we were aggregating migration flows across years and geographies from several tables, and calculating net flows between places). One of our goals for this project was to use modern tools and avoid the clunky use of email. With the Jupyter notebooks, git and github for storing and syncing our work, and ShareLaTeX for writing the paper, we avoided using email for constantly exchanging revised versions of scripts and papers. Ultimately I had to use latex2rtf to convert the paper to a word processing format that the publisher could use. This post helped me figure out which bibliography packages to choose (in order for latex2rtf to interpret citations and references, you need to use the older natbib & bibtex combo and not biblatex & biber). If you are doing similar research, Zillow has an excellent post that dicusses the merits of the different datasets. There are also good case studies on Washington DC and Philadelphia that employ the same datasets. Posted in analysis, articles, census data, scripting and tagged latex, migration, nyc, population, python, research, sqlite on March 5, 2018 by Frank. We recently created a PostgreSQL / PostGIS database on a server on our local campus network and spent the last few months loading data into it. We have a couple of different SQLite / Spatialite projects that we produce and I needed to move a large number of attribute tables from them into the Postgres database. My initial idea was to simply create a SQL dump file out of SQLite and then restore it in Postgres. I encountered a number of problems in doing this; there are slight differences in how each database creates and handles dump files. The solutions I found involved lousy things like opening the dump file in an editor (not feasible if the file is huge) and finding and replacing parentheses and commas, or running the file through a script to remove them. That gave me a better idea – Python has SQLite and PostgreSQL modules (sqlite3 and psycopg2 respectfully). I could connect to the SQLite database and load the tables into Python’s data structures, and then simply connect to my PostgreSQL database and write them out. The original CREATE TABLE statements are stored in a master table; if I grab those statements and then the data that goes with them, I can simply recreate everything. The code is below. First I define a number of variables that I hard code for each batch of tables. The SQLite variables are the name and path to the database (sqdb) and a string that I’ll use in a LIKE clause to grab certain tables (sqlike). For example, if my series of tables starts with yr followed by a year (yr2017) my string would be ‘yr%’. The remaining variables are for the Postgres database: pgdb (database name), pguser, pgpswd (my username and password), pghost, pgport (address of the database server on port 5432), and pgschema which is the name of the schema I want to write to. I connect to the SQLite database and read all the names of the tables that match my LIKE statement from the master table. This returns a series of tuples where the name of the table is in the first position; I grab these and save them in a list. Then I loop through that list of tables and get the CREATE TABLE statement that’s stored in the master table and save that in string variable called create. Then I fetch all the rows for that table and save them in a tuple called rows. Lastly, I count the number of columns and create the number of string substitutions I’ll need in my SQL statement in a place holder variable (minus the last character, to remove a comma from the end of the statement). That gives me everything I need for the first table. Then I connect to Postgres, set my schema path, execute the create table statement, and load the values in. Voila! If successful, we return to the top of the table loop and grab the next table. When we’re all done, we close the connection to the database. There are a few caveats to this. First, data in SQLite is loosely typed, so you’re allowed to get away with storing strings in numeric columns and vice versa. PostgreSQL will balk at this, so if your SQLite data is pretty loose this approach (and any other approach really) will fall flat. You’d have to tighten up your SQLite data first. Second, this approach doesn’t handle spatial data / geometry columns. In instances where I had spatial data and I tried copying it over, it failed; there are differences with how spatial data is tied to the underlying tables in each database so moving it requires a special process. I tried using some spatial database modules in Python but couldn’t get them working. Ultimately, since my spatial layers were point features and I had the original X and Y coordinates stored in numeric columns, I simply copied the data over and left the geometry behind, and once I was in PostGIS I recreated the geometry from the coordinates. Another alternative would be to use the OGR tools to copy spatial (and attribute) data over – I’ve tried this in a few other instances in the past with success, but was going in the opposite direction (from PostGIS to Spatialite) at the time. While I haven’t tried it, you could modify the code if you wanted to go in the other direction (copy data from PostgeSQL to SQLite). You would just need to identify the system tables in PostgreSQL where the table names and create statements are stored. Going in this direction, the abundance of data types in PostgreSQL may be a problem – in SQLite your only options are: integer, real, text, and blob. SQLite may be able to take certain types and convert them to what it needs (i.e. take a varchar and save it as text) but I’m not sure it can handle every case. You could always run each create table statement string through a find and replace operation to modify the data types. Posted in gothos.info, spatial databases and tagged postgis, postgresql, python, spatialite, sql, sqlite on July 24, 2017 by Frank. Python Geocoding Take 1 – International Addresses I discussed my recent adventures with geocoding addresses outside the US. In contrast, there are countless options for batch geocoding addresses within the United States. I’ll discuss a few of those options here, but will focus primarily on the US Census Geocoder and a Python script I’ve written to batch match addresses using their API. The code and documentation is available on my lab’s resources page. ESRI’s geocoding services allow you (with an account) to access their geocoding servers through tools in the ArcToolbox, or you can write a script and access them through an API. QGIS has a third-party plugin for accessing Google’s services (2500 records a day free) or the Open Streetmap. You can still do things the old fashioned way, by downloading geocoded street files and creating a matching service. Alternatively, you can subscribe to any number of commercial or academic services where you can upload a file, do the matching, and download results. For years I’ve used the geocoding services at Texas A&M that allow you to do just that. Their rates are reasonable, or if you’re an academic institution and partner with them (place some links to their service on their website) you can request free credits for doing matches in batches. The Census Bureau’s TIGER and address files are often used as the foundational layers for building these other services, to which the service providers add refinements and improvements. You can access the Census Bureau’s services directly through the Census Geocoder, where you can match an address one at a time, or you can upload a batch of 1000 records. It returns longitude and latitude coordinates in NAD 83, and you can get names and codes for all the census geographies where the address is located. The service is pretty picky about the structure of the upload file (must be plain text, csv, with an id column and then columns with the address components in a specific order – with no other attributes allowed) but the nice thing is it requires no login and no key. It’s also public domain, so you can do whatever you want with the data you’ve retrieved. A tutorial for using it is available on our lab’s census tutorials page. datafile – this is the name of the file you want to process (file name and extension). If you place the geocode_census_funct.py file in the same directory as your data file, then you just need to provide the name of the file. Otherwise, you need to provide the full path to the file. delim – this is the delimiter or character that separates the values in your data file. Common delimiters includes commas ‘,’, tabs ‘t’, and pipes ‘|’. header – here you specify whether your file has a header row, i.e. column names. Enter ‘y’ or ‘yes’ if it does, ‘n’ or ‘no’ if it doesn’t. start – type 0 to specify that you want to start reading the file from the beginning. If you were previously running the script and it broke and exited for some reason, it provides an index number where it stopped reading; if that’s the case you can provide that index number here, to pick up where you left off. addcol – provide a list that indicates the position number of the columns that contain the address components in your data file. For an unparsed address, you provide just one position number. For a parsed address, you provide 4 positions: address, city, state, and ZIP code. Whether you provide 1 or 4, the numbers must be supplied in brackets, as the function requires a Python list. The beginning of the script “sets the table”: we read the address columns into variables, create the output files (one for matches, one for non-matches, and a summary report), and we handle whether or not there’s a header row. For reading the file I used Python’s CSV module. Typically I don’t use this module, as I find it’s much simpler to do the basic: read a line in, split it on a delimiter, strip whitespace, read it into a list, etc. But in this case the CSV module allows you to handle a wider array of input files; if the input data was a csv and there happened to be commas embedded in the values themselves, the CSV module easily takes care of it; if you ignore it, the parsing would get thrown off for that record. In terms of expanding my skills, the new things I had to learn were exception handling and control flows. Since the censusgeocoding module is a thin wrapper, it had no built in mechanism for retrying a match a certain number of times if the server timed out. This is an absolute necessity, because the census server often times out, is busy, or just hiccups, returning a generic error message. I had already learned how to handle crashes in my earlier geocoding experiments, where I would write the script to match and write a record one by one as it went along. It would try to do a match, but if any error was raised, it would exit that loop cleanly, write a report, and all would be saved and you could pick up where you left off. But in this case, if that server non-response error was returned I didn’t want to give up – I wanted to keep trying. So on the outside there is a loop to try and do a match, unless any error happens, then exit the loop cleanly and wrap up. But inside there is another try loop, where we try to do a match but if we get that specific server error, continue: go back to the top of that for loop and try again. That loop begins with While True – if we successfully get to the end, then we start with the next record. If we get that server error we stay in that While loop and keep trying until we get a match, or we run out of tries (5) and write as a non-match. In doing an actual match, the script does a parsed or unparsed match based on user input. But there was another sticking point; in some instances the API would return a matched result (we got coordinates! ), but some of the objects that it returned were actually errors because of some java problem (failed to get the tract number or county name – here’s an error message instead!) To handle this, we have a for i in range loop. If we have a matched record and we don’t have a status message (that indicates an error) then we move along and grab all the info we need – the coordinates, and all the census geography where that coordinate falls, and write it out, and then that for loop ends with a break. But if we receive an error message we continue – go back to the top of that loop and try doing the match again. After 3 tries we give up and write no match. Figuring all that out took a while – where do these loops go and what goes in them, how do I make sure that I retry a record rather than passing over it to the next one, etc. Stack Exchange to the rescue! Difference between continue, pass and break, returning to the beginning of a loop, breaking out of a nested loop, and retrying after an exception. The rest is pretty straightforward. Once the matching is done we close the files, and write out a little report that tells us how many matches we got versus fails. The Census Geocoder via the API is pretty unforgiving; it either finds a match, or it doesn’t. There is no match score or partial matching, and it doesn’t give you a ZIP Code or municipal centroid if it can’t find the address. It’s all or nothing; if you have partial or messy addresses or PO Boxes, it’s pretty much guaranteed that you won’t get matches. There’s no limit on number of matches, but I’ve built in a number of pauses so I’m not hammering the server too hard – one second after each match, 5 seconds after every 1000 matches, a couple seconds before retrying after an error. Your mileage will vary, but the other day I did about 2500 matches in just under 2 hours. Their server can be balky at times – in some cases I’ve encountered only a couple problems for every 100 records, but on other occasions there were hang-ups on every other record. For diagnostic purposes the script prints every 100th record to the screen, as well as any problems it encountered (see pic below). If you launch a process and notice the server is hanging on every other record and repeatedly failing to get matches, it’s probably best to bail out and come back later. Recently, I’ve noticed fewer problems during off-peak times: evenings and weekends. The script and the documentation are posted on our labs resources page, for all to see and use – you just have to install the third party censusgeocode module before using it. When would you want to use this? Well, if you need something that’s free, this is a good choice. If you have batches in the 10ks to do, this would be a good solution. If you’re in the 100ks, it could be a feasible solution – one of my colleagues has confirmed that he’s used the script to match about 40k addresses, so the service is up to the task for doing larger jobs. If you have less than a couple thousand records, you might as well use their website and upload files directly. If you’re pushing a million or more – well, you’ll probably want to set up something locally. PostGIS has a TIGER module that lets you do desktop matching if you need to go into the millions, or you simply have a lot to do on a consistent basis. The excellent book PostGIS in Action has a chapter dedicated to to this. In some cases, large cities or counties may offer their own geocoding services, and if you know you’re just going to be doing matches for your local area those sources will probably have greater accuracy, if they’re adding value with local knowledge. For example, my results with NYC’s geocoding API for addresses in the five boroughs are better than the Census Bureau’s and is customized for local quirks; for example, I can pass in a borough name instead of a postal city and ZIP Code, and it’s able to handle those funky addresses in Queens that have dashes and similar names for multiple streets (35th st, 35th ave, 35th dr…). But for a free, public domain service that requires no registration, no keys, covers the entire country, and is the foundation for just about every US geocoding platform out there, the Census Geocoder is hard to beat. Posted in gothos.info, scripting, series - python geocoding and tagged census geography, coordinates, geocoding, python on May 30, 2016 by Frank. This past semester has been the semester of geocoding. I’ve had a number of requests for processing large batches of addresses. Now that the term is drawing to a close, I’ll share some of my trials and tribulations. In this post, I’ll focus on my adventures in international geocoding. First, it’s necessary to provide some context. As an academic librarian I’m primarily engaged with assisting students and faculty with their coursework and their research. My users are interested in getting coordinates for data so that they can do both analysis and visualization, which requires them to download the actual coordinate data in a batch and integrate it with the rest of their projects. My adventure began when a professor asked me for help in geocoding about 1 million addresses – in Turkey. Right from the beginning, many of the usual sources I would turn to (for US addresses) were out the window. I knew that I could do small scale batches of international addresses with the mmQGIS geocoding plugin, so I started testing there. The address file we had consisted of unparsed addresses, and the formating looked rather chaotic – but after doing some research I discovered that geocoding Turkish addresses was a tough proposition. The Open Street Map plugin (using Nominatim) returned no matches for our 1000 test cases. The Google results were much better, so we decided to investigate writing a script and using an API and to pay for the matching. According to the documentation, it would end up costing $500 to do 1 million addresses. I searched around for some Python APIs and found what I believed was the official one for google maps geocoding. So I spent a day writing a script that would loop through the addresses, which we divided into batches of 100k records each (which is the max you can do per day with Google if you set up billing), and the professor obtained an API key and set up billing for the account. The interface for setting up and managing the Google APIs was ridiculously confusing. Eventually we were set and I let the script rip, and found that it wouldn’t rip for long. It would consistently stop after doing a few thousand records. I had written it to write results one by one as they were obtained, and to exit cleanly in the case of errors. Upon exit, it provides the index number of the record where it stopped, so I was able to pick up where it left off. But the server would constantly time out – sometimes it could do 10 to 12k records in a stretch, but often less, so I could never leave it unattended for long. The matches themselves were a mixed bag – you could throw absolute garbage at the Google geocoder and still get a match – if not to an address or property, then to a street segment, and beyond that to useless things like postal codes, administrative districts, and the country as a whole (i.e. I can’t find your address, so here are the coordinates for the geographic center of Istanbul, or for all of Turkey. Have a nice day). It seemed like it was going to be a long climb to get to 1 million – but after about 100k we could go no further. Google simply refused every additional request. A new API key would get us a little further, but soon after that nothing would work and we wouldn’t get any useful error messages to explain why. Having never done anything like this before, I started to investigate why, and eventually discovered the problem: these web mapping geocoding services, even if you pay for them, are not meant to be used this way. Buried in the documentation I found the license restrictions, which stipulate that you are not allowed to download any of the data, and you had to plot every coordinate you retrieved onto a Google map. This is a service for web mapping developers, not researchers. Why hadn’t I realized this before? One, I simply had never made this distinction as I thought geocoding was geocoding, and in my world of course people are going to want to download the coordinates. Two, the Internet is full of thousands of little blog posts and tutorials which demonstrate how to use the Google Maps APIs, so I thought this was possible. But they never mention any of the caveats about what you can and can’t do with these services. In addition to violating the service terms, what I was doing was akin to yelling in the back of a crowded room, as I was hammering their server, sending requests as fast as I could with no limit. A normal web mapping application (which is what the service is designed for) would send a fraction of those requests in that amount of time. No wonder the requests were refused. Thus ended my Google geocoding experiment. Nope – How About ESRI Instead? So what to do next? I found that most of the other commercial web mapping services didn’t provide anything near the maximum caps and low prices that Google was offering. Mapquest for example requires that you subscribe to an account on a monthly or annual basis, and 100k is the amount you could do in a month. Most of the other commercial services also prohibit any downloads. The big exception is ESRI – they are one of the few that understand and cater to the academic market, and they do allow downloads: they say quite plainly: “Take your Coordinates with you. Once you have the results of a Geocode operation, they’re yours to take anywhere.” My university has a site license for ArcGIS, but it doesn’t include geocoding. You can create an account and have a certain number of free credits, and after that you pay. 1 mil records was going to cost about $4000 – substantially more than Google, but totally legal. ESRI provides lists of countries and ranks them according to how complete their street network coverage is. You can use their API via a script, or you can set up the service in ArcGIS Desktop and do the matching through the ArcToolbox. This would be painfully slow if you were doing a large job (like this one) but for the purpose of testing it out with a few hundred records this is what I tried. Unfortunately, in our case the results still weren’t good. Most of the addresses were to administrative or postal areas; not specific enough. What often happens in librarianship when a patron makes an initial request (this should be a piece of cake, right?) and then discovers that what they’re looking for is more involved (ahhh this will be tougher than we thought), is that they reframe the question. He went back through the addresses with a research partner and winnowed them down based on what they really, absolutely needed, so now we were down from 1 million to just finding a match for about 300k. His colleague also suggested that we use Yandex, the Russian search and mapping engine. The structure of Russian addresses is quite similar to Turkish ones, and since Russia is closer to Turkey geographically and economically Yandex might do a better job. If the result you get back is not OK (ok is False – nothing matched), then write the record to the unmatched file. Otherwise, get the bits and pieces out of the json object that you want, append them to the record, and write the whole record out to a matched file. But is it legal? It was unclear to me; they specify that map data is meant for personal/noncommercial use and in the same sentence: “Any copying of the Data, their reproduction, conversion, distribution, promulgation (publication) in the Internet, any use of the Data in mass media and/or for commercial purposes without a prior written consent of the right holder, shall be prohibited”. Does that mean any copying, or just copying for commercial use or for redistributing the data? In our case, this is for academic non-profit use and the data (individual geocoded records) wasn’t going to be republished – it would be used for plotting distances between locations and making highly generalized static dot maps for an article. At this stage we seemed to be out of options – if you need to geocode a large batch of international addresses, AND you are willing to pay for it, where on Earth can you go? Ultimately, I left it up to the professor to contact them or not, and we decided to roll the dice. For my part, I engineered the script to put a minimum load on their servers – essentially I could take 24 hours to do 25k records. I used the time and random modules in Python to build pauses in between records to slow things down. In sharp contrast to Google, the Yandex servers were amazingly reliable – they were able to do batches of 25k records every single time without timing out – not even once – and in less than a couple weeks we were finished. About 50% of the matches were good, and for the others he and a research assistant went back and cleaned up unmatched records, and I gave them the script so they could try again. If you need to geocode a large batch of foreign addresses for academic or research purposes, forget Google. Their service was less than stellar (to put it mildly) and anyway it’s a violation of their license agreement. And all those lousy little blog posts out there that show you how to use the Google Map APIs with Python and say “Gee isn’t this great!” are largely useless for practical purposes. The Python Geocoder module is simple to use and let’s you write a single script to access a ton of different geocoding services, including Open Streetmap, Yandex, and ESRI. But you still need to review the terms of service for each one to see what’s allowed and what the daily limits are. If you have funding for your research project, and ESRI geocoding has good coverage for your geographic area (based on their documentation but also on your own testing) then go with them, as you’re free and clear to download data under their terms. Arc Desktop will be too sluggish for large batches so write a script – you can use the Python Geocoder. Otherwise – the Open Street Map / Nominatim services are worth a try but your success will vary by country. I had used them before for addresses in France with fair success, but it didn’t help me with Turkey. Happy geocoding, comrades! In my next post I’ll discuss my experience with batch geocoding addresses here in the US of A with Python. Posted in gothos.info, scripting, series - python geocoding and tagged esri, geocoding, google, python on May 16, 2016 by Frank. 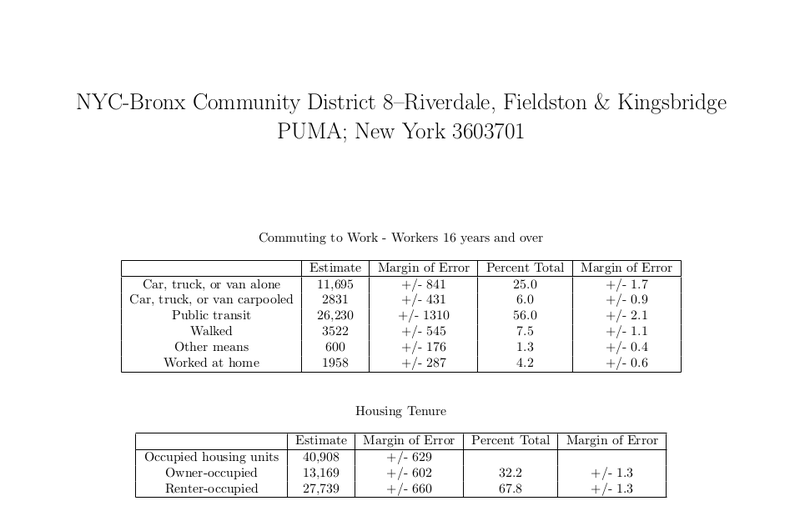 In previous posts I demonstrated how to pull data from a sqlite / spatialite data to generate reports using Python and Jinja, where Jinja2 is used as a template engine for creating LaTeX documents and the NYC Geodatabase is used as my test case. Up until now the scripts pulled the data “as is”. In this post I’ll demonstrate how I created derived variables, and how I created the Jinja2 template for the report. Please note – instead of duplicating all of the code I’m just going to illustrate the new pieces – you should check out the earlier posts to see how all the pieces fit together. Aggregating census data is a pretty common operation, and when working with American Community Survey estimates it’s also necessary to calculate a new margin of error for each derived value. I wrote two functions to accomplish this. For each function you pass in the keys for values you want to aggregate, a name which will be the name of the new variable, and a dictionary that contains all the keys and values that were taken from a database table for a specific geography. Rather than creating a new dictionary, these new values are simply appended to the existing dictionaries that contain the data taken from each of the ACS data tables in the database. They can be referenced in the template using their new column name. Like our previous aggregate script, this function appends our new values to the existing table-dictionary – in this case, one called area. What’s going on here? The first thing we need to do is associate the census tracts with the PUMAs they’re located in. The NYC Geodatabase does NOT have a relationship table for this, so I had to create one. We have to pass in the table name, the relationship table, the unique IDs for each, and then the ID and the geography that we’re interested in (remember our script is looping through PUMA geographies one by one). The first thing we do is a little trick – we get the names of every column in the existing data table, and we append them to a list where we create a new column name based on the existing one (in this case, append a 0 in front of the column name – in retrospect I realize this is a bad idea as column names should not begin with numbers, so this is something I will change). Then we can take the list of column names and create a giant string out of them. With that giant string (called summer) we can now pass all of the parameters that we need into the SQL query. This selects all of our columns (using the summer string), the table names and join info, for the specific geographic area that we want and then groups the data by that geography (i.e. all tracts that have the same PUMA number). Then we zip the column names and values together in a dictionary that the function returns. The Jinja template is going to look pretty busy compared to our earlier examples, and in both cases they’re not complete (this is still a work in progress). I wanted to design the entire report first, to get a sense for how to balance everything I want on the page, without including any Jinja code to reference specific variables in the database. So I initially worked just in LaTeX and focused on designing the document with placeholders. Ultimately I decided to use the LaTeX minipage environment as it seemed the best approach in giving me control in balancing items on the page. The LaTeX wikibook entries on floats, figures, and captions and on boxes was invaluable for figuring this out. I used rule to draw boxes to serve as placeholders for charts and figures. Since the report is being designed as a document (ANSI A 8 1/2 by 11 inches) I had no hang-up with specifying precise dimensions (i.e. this isn’t going into a webpage that could be stretched or mushed on any number of screens). I loaded the xcolor package so I could modify the row colors of the tables, as well as a number of other packages that make it easy to balance table and figure captions on the page (caption, subscaption, and multicol). You may have noticed references to figures and charts in some of the code above. I’ll discuss my trials and tribulations with trying to use matplotlib to create charts in some future post. Ultimately I decided not to take that approach, and was experimenting with using various LaTeX packages to produce charts instead. Posted in census data, gothos.info, scripting, series - report writing and tagged jinja2, latex, python, sql, sqlite on August 6, 2015 by Frank. I’ve got a lot of ground to cover, picking up where I left off several months ago. In earlier posts I presented the concept for creating reports from sqlite databases using Python, Jinja, and LaTeX, and looked at different methods for passing data from the database to the template. I’m using the NYC Geodatabase as our test case. In this entry I’ll cover how I implemented my preferred approach – creating Python dictionaries to pass to the Jinja template. One of the primary decisions I had to make was how to loop through the database. Since the reports we’re making are profiles (lots of different data for one geographic area), we’re going to want to loop through the database by geography. So, for each geography select all the data from a specific table, pass the data out to the template where the pertinent variables are pulled, build the report and move on to the next geography. In contrast, if we were building comparison tables (one specific variable for many geographic areas) we would want to loop through the data by variable. And then we generate reports by looping through all the geographies in that dictionary, and we pass in the ID of each geography to pull all data from a data table for that geography out of the table and into a dictionary. The Jinja template (as a LaTeX file) is below – the example here is similar to what I covered in my previous post. We passed two dictionaries into the template, one for each data table. The key is the name of the variable (the column name in the table) and the value is the American Community Survey estimate and the margin of error. We pass in the key and get the value in return. The PDF output follows. In this example we took the simple approach of grabbing all the variables that were in a particular table, and then we just selected what we wanted within the template. This is fine since we’re only dealing with 55 PUMAs and a table that has 200 columns or so. If we were dealing with gigantic tables or tons of geographies, we could modify the Python script to pull just the variables we wanted to speed up the process; my inclination would be to create a list of variables in a text file, read that list into the script and modify the SQL function to just select those variables. What if we want to modify some of the variables before we pass them into the template? I’ll cover that in the next post. Posted in gothos.info, scripting, series - report writing and tagged jinja2, latex, python, sql, sqlite on July 28, 2015 by Frank.